After Army Staff Sergeant Shilo Harris’s armored vehicle was struck by an IED in Iraq 11 years ago, he faced a long road to recovery. The explosion, which killed three of his fellow soldiers, left Harris with severe burns on 35 percent of his body, leading to the loss of his ears, the tip of his nose and three fingers, as well as a fractured left collarbone and C-7 vertebrae. Harris experienced more than 75 surgeries, as well as a battle with PTSD. During the long recovery process, Harris was prescribed opioids to deal with his pain. At a press conference to promote alternatives to opioids with Ohio Attorney General and gubernatorial candidate Mike DeWine on Tuesday, Harris said he didn’t know he was addicted until it was too late. On a three-hour trip to visit family away from his treatment facility in San Antonio, Harris ran out of medication. Harris was medically retired from the Army in 2010. Eventually, he was slowly weaned off of his medication, but a major setback came in the form of a traffic accident that required him to return to some of the opioids. Harris said he fell into a depression, and might have been hopeless had he not discovered alternative treatments. “Chiropractic care saved my life in every sense,” he said. 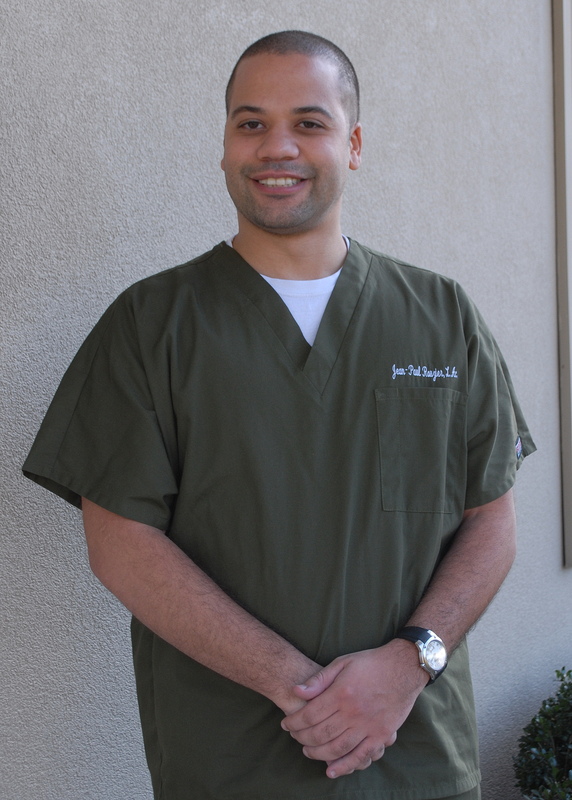 Chiropractic treatment helped Harris manage his pain and overcome his addiction, he said. 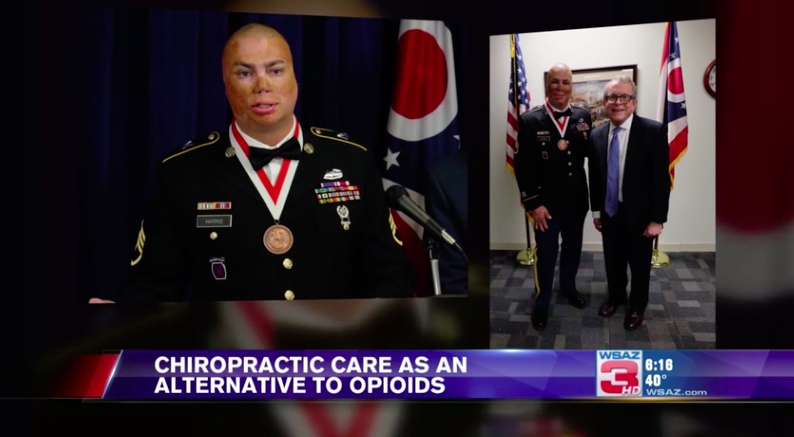 He’s since become the national spokesman for the Patriot Project, and advocates alternatives to opioids for pain management. DeWine said he convened a task force of managed care and insurance companies last summer to develop “innovative treatment”options to help fight the opioid epidemic. He said he expects recommendations from that group within a few weeks, but added the purpose of Tuesday’s press conference was to draw attention to alternative methods of pain treatment. Ohio Senate Majority Whip Gayle Manning, R-North Ridgeville, said chiropractic care isn’t the only option available as an alternative to opioids in pain management. Acupuncture, massages, and even yoga could be alternatives, she said. According to the Harvard School of Medicine, exercise, weight loss, psychotherapy and even meditation and other alternatives are available in place of opioids, which can be heavily addictive. In 2016, over 4,300 Ohioans died from opioid use. Some say DeWine isn’t doing enough to curb the opioid epidemic. On Tuesday, the Ohio Democratic Party released a statement blasting DeWine for what they say is a “lethargic” response to the opioid epidemic. The Democratic release cited DeWine’s recent appearance on “The State of Ohio” program, in which he acknowledged the crisis has been growing. Ohio’s drug overdose deaths rose 39 percent between mid-2016 and mid-2017, according to a previous Dispatch report. “The numbers have been going up, there’s no doubt about that,” DeWine said on the show. Harris said the opioid epidemic was more than just a veteran or Ohio problem, but a national issue. Fellas, you are probably doing this! We know it sounds odd, but most people aren’t using or wearing their wallet properly, and it’s putting their spine at risk. And ladies, you’re not off the hook—you’re probably not wearing your purse properly either. Problem: Many people—men mostly—carry a wallet in their back pocket, and often it’s a bulky wallet. Sitting on a wallet can raise one side of your hip anywhere from ¼ to 2 inches, causing your body to lean to one side or the other which creates an imbalance. Any imbalance in the body, specifically to the spine, can cause early and abnormal degeneration of joints and other tissues. Think of it this way: Sitting on your wallet is similar to wearing a high heel on one foot and a flip flop on the other. Solution: The best option is to carry your wallet in your front pocket—even if your wallet is slender. It’ll take some retraining to get used to this, but it’s worth it in the end. If you just can’t make the switch and you want to keep your wallet in your back pocket, remove excess items or switch to a slimmer style of wallet. And always remove your wallet when you’ll be sitting for extended periods of time—when in the car, at your desk, etc. Problem: Similarly to wallets, purses can also wreak havoc on your spine and create posture problems. Often the shoulder on which you carry your purse will be visibly higher than the other; it’s used to being weighed down—so without your purse it tends to pull upwards. Any habitual action that is one-sided is going to cause a balance issue. When you hold your purse on one side, you’re activating certain muscle groups for an extended period of time. It’s like walking around with a dumbbell in one hand for the majority of the day—and never switching to the other side. Solution: When carrying a purse, the best fix is to go hands-free and opt for a purse or bag that has a strap across your chest. Always switch sides from time-to-time. Remember to keep heavier items out of your bag. If you’re carrying a purse in your hands, make a conscious effort to switch from your right to left hand every so often. Elisa Maggio, a CranioSacral practitioner; Reiki Master and LMT in PA & NJ, specializes in “listening” with her hands to the body ~ mind connection. 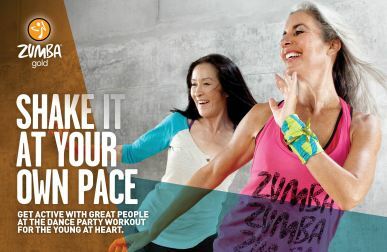 Take this opportunity to embrace inner peace into your daily wellness regimen. Now practicing at Wagner Integrative Therapies by appointment. We are celebrating the arrival of Spring by opening our doors for a casual evening of fun and information. 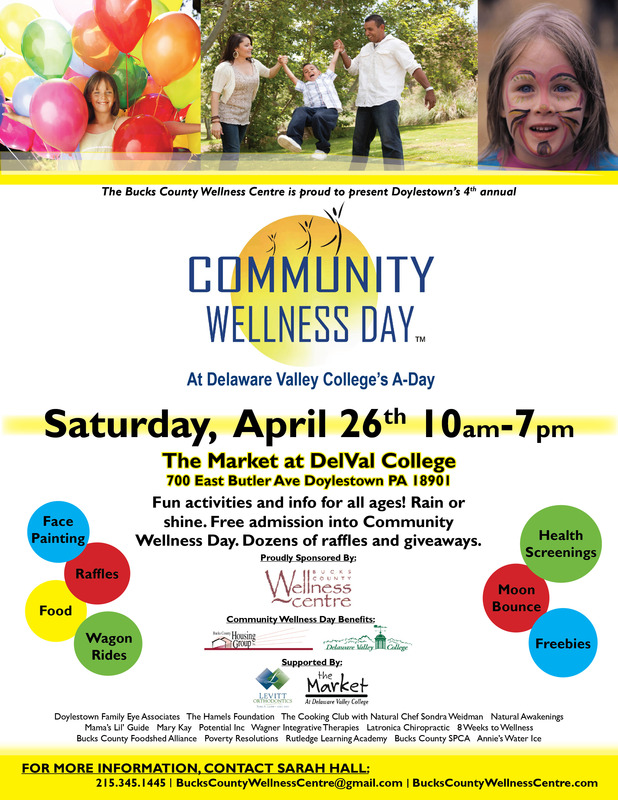 This is an opportunity for you, your friends and family to come ask your burning questions, get tips, advice, and share your health concerns and challenges with our pros. …preventing and addressing pain, losing weight, relieving stress, stopping smoking, erasing fears and phobias, balancing your Qi, improving wellness through diet and exercise, chronic pain & pain management, family chiropractic & wellness, acupuncture, cupping, cold laser therapy, therapeutic massage, hypnotherapy, sound & vibrational healing, dietary issues and nutrition, food supplements, and more. 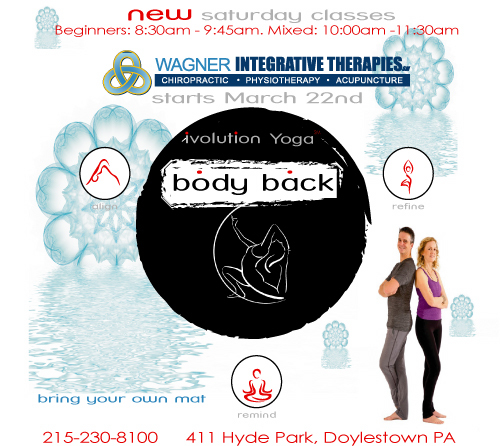 Come Meet our New Chiropractic Partner, new therapists, and find out about the exciting new services at Wagner Integrative Therapies, THE place for you to explore new ways to live your healthiest and happiest life! Drinks, snacks and laughter guaranteed! David van Zwieten and Marguerite Hendersen will be offering “The Bὃdy Bāck” practice at Wagner Integrative Therapies. The Bὃdy Bāck is sure to introduce fresh ideas into your yoga experience. There are thousands of percussion massage products on the market. After doing our homework, we decided to add the G5 GK3 to our treatment tool box. The G5 GK3, (AKA Helga) produces a gyratory massage therapy with a variable speed from 15 – 60 CPS (cycles per second). Our G5 GK3 is complete with 10 applicator heads for a variety of specific and targeted treatment plans. Our patients are loving the G5 GK3. It is amazing! What is the best way to end your work week? Treat yourself to Therapeutic Acupuncture in a quiet group setting, that’s how.